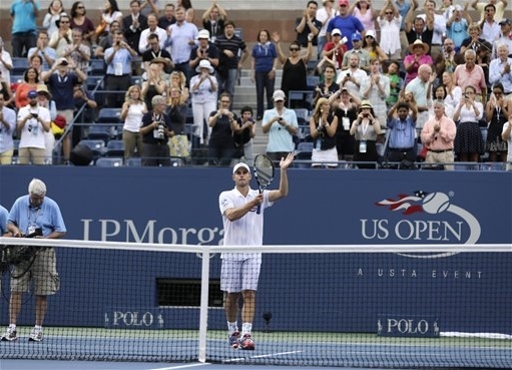 Man, I haven't even been able to post about Roddick retiring! So yeah, I've been kind of busy lately. I post some U.S. Open picks and next thing you know, that's it. But not it forever, of course, I could never leave behind TTA?! But wow, how about that Roddick leaving the game behind, huh? Personally, I think he still had some solid top-13 level tennis in him, at least. Anyway, I thought I'd have been more broken up, but I'm OK. He's going to be fine and best of luck to him. And personally, as a die-hard fan of U.S. tennis, thanks "Truth" (old readers of this blog know that's my nickname for him) for all you've done! And while I'm here, how about a few more "how about that"'s? Like, how about that Andy Murray? Or Serena Williams? Or Tomas Berdych beating Roger Federer? Or the Bryan Brothers making more Slam history? How about Spain in the Davis Cup finals again? Or Victoria Azarenka and her U.S. Open finals loss? How about Rafael Nadal missing more time? Or Laura Robson making her first career singles final today? I could go on, but I'll stop there. I'll be back soon, though, you watch! You see, I've been doing this full-time work thing, some of which you can read about at The Life and Times of the Anxious Freelancer. Read there, but be sure to come back here!